I got all excited when my person told me to get in the car this morning. I should have suspected something when I saw the suitcases. I was hoping to end up somewhere adventurous and fun – but here I am at the dog hotel. And I can’t even tell you about my adventures here, because if my person finds out that I have fun sometimes she might make me stay longer. And I don’t like it here that much. A couple weeks ago my person went to a camera meeting and they had a drawing for some photo programs. She won a program called Snap Art that makes photos look like paintings or drawings. So you get to see me in art all week. It looks like my person spent hours with her brushes, but she really only spent a few minutes on the computer. This is me in impasto (a technique where the paint is laid on thickly). Have fun at doggie hotel! Woooooowooooooooo! Ku, I’d have more fun if you were here with me. Marina, she still won’t watercolor me for real. She says she hasn’t practiced dogs enough – but I never see her practicing. Thanks Lily and Edward. I’m so glad you’re such dependable friends. Your secret is safe with us, don’t you fear! Even though that picture didn’t take all that long it still looks brilliant. Thanks Pigs. And thanks for being such trustworthy friends. 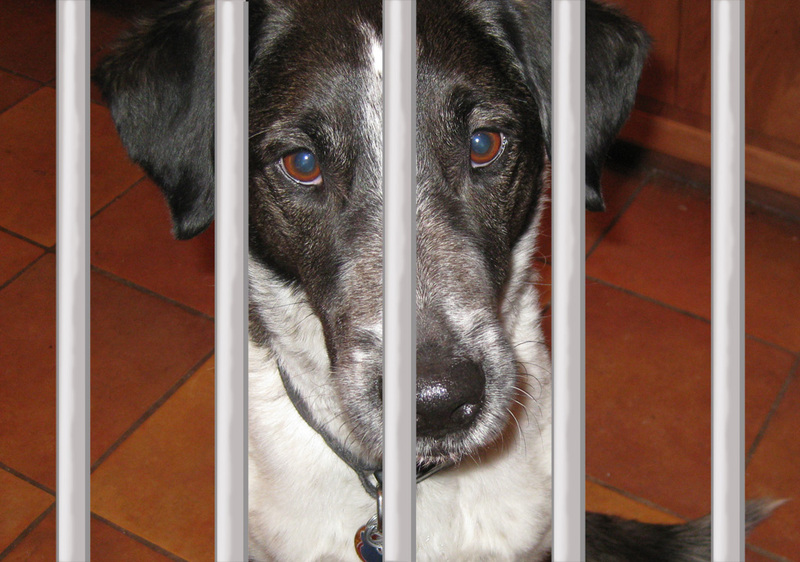 I hope you have good time at the doggy hotel Bongo, and I promise I won’t tell your human that you did. That painting thing looks pretty cool. At least we’ll get to see your handsome face this week. Thanks FireBonnet. It’s kind of cool seeing some of my friends here. But thanks so much for not telling my person. Fredrieka, I’ll take the treats and my person. Lola, they can’t be “spas” unless they give us lots of doggie massages and a pool to swim in. Thanks Chancy and Mumsy. I’m having a good time, but home is still the best. Thanks Karen. Maybe I should take up a new career as a model. Dog Hotel! Ugh! I hope there are enough cuddles and cookies to last you. Meanwhile, we’ll enjoy the art. Thanks Cupcake. What I miss most are my trails. Just think how lucky the people at the dog hotel are to have you there for a while. Bet they miss you bunches when you go home. Like the painting. Thanks Patricia. I guess I do make it special to the people at the dog hotel. You are a model dog, for sure. Thanks Dogdaz. I think I might need to take up a new modeling career. Thanks Kevin. 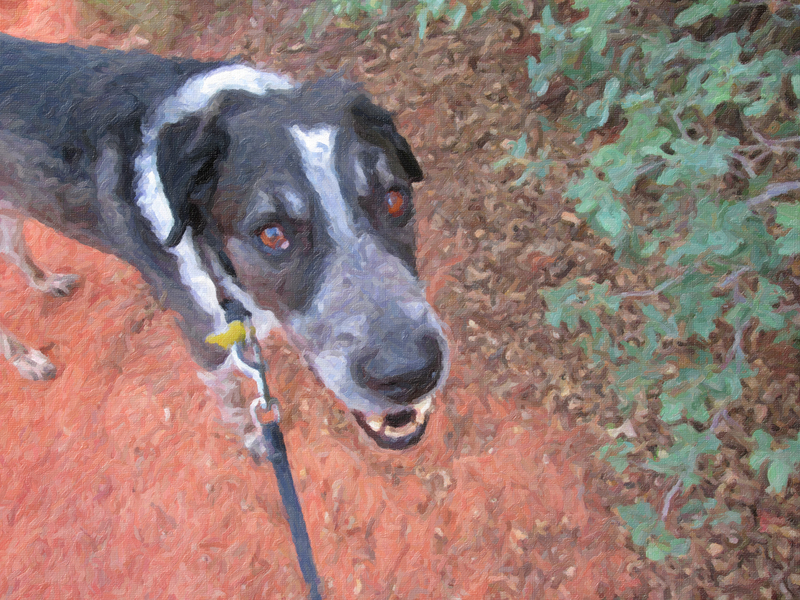 Yes, my person has a special computer program that makes pictures look like paintings. Poor guy! My dog Magic hates the car, but loves to “Go” most places. When we ask him if he wants to “Go in the car,” he has a tendency to stop listening after the word “Go” and then he’s extremely excited until we load him into the back seat. Brantley, I like to go. I just wish it was always going someplace like swimming.